Rename the standard objects listed in the requirements below to the appropriate Relaxation Gauntlet schema labels specified. For the purpose of this challenge, assume that all reports that relate to opportunities run using opportunity product service dates from 1/1/2026 to 12/31/2026. Yes, that’s right. 2026. You’re the new Salesforce admin for Relaxation Gauntlet, the leading provider of epic vacation packages. The company specializes in outdoor adventures—trekking, rock climbing, scuba diving, snowboarding, and more. Relaxation Gauntlet offers an adrenaline rush for everyone. Your goal is to redesign the UI and optimize the org so that it’s as sleek and efficient as a zipliner in flight. Relaxation Gauntlet is rightly proud of its reputation for amazing customer service and transparent services and contracts. Your work tuning the org will not only help the company automate, but also help reps maintain their high quality of service. Fulfillment—Purchased adventure package. This object contains the scheduling information, forms like waivers or insurance, and all details specific to the excursion booked. This object separates the sales records from the adventure audit records. You’ve developed the following set of requirements over the course of many meetings with Relaxation Gauntlet stakeholders. As a global company, Relaxation Gauntlet wants to make sure that its entire sales organization is aligned with how to sell adventure packages. Update the existing Opportunity Stages to only these values (with their probability): New (10%), Needs Information (20%), Negotiation (40%), Negotiation Rejected (40%), Awaiting Approval (60%), Deposit Made (70%), Scheduled (80%), Completed (100%), Cancelled (0%). The sales process named Individual Opportunity includes all stages. In each stage of each pipeline, highlight key fields to monitor (see below) and include appropriate guidance for success to help sales reps make the sale. Name it Opportunity Path. Note that Completed takes the place of Closed Won in the standard CRM stages, and Cancelled takes the place of Closed Lost. Ask - "Is there anything else you'd like to know or need in order to submit your forms?" Use the promo "CUST05" for an instant 5% rebate if there is no negotiation involved. Leave discount blank in this case. Tell the customer about complimentary rebate. A big part of closing deals is the art of creative discounting. Of course, you can’t just give trips away for free, so you set up an approval process for all opportunities with discounts. This approval process, called Approval for Package Deal, is available whenever the opportunity stage is Awaiting Approval, and it assigns approvals back to the opportunity owner. If the opportunity owner approves the discount, the opportunity record’s stage is set to Scheduled. Otherwise, set the stage to Negotiation Rejected. You notice that the Discount field isn’t required; not wise considering you’ll be working with it for automating the approvals process. You require the field and set the default value to 0. Create the following three automation procedures for the sales and fulfillment teams. Create a process named Fulfillment Creation to automatically create a fulfillment record in Salesforce whenever an adventure package is created. As long as the opportunity stage is not Cancelled at the time an adventure is added and a fulfillment has not already been created for the adventure package, you create a new fulfillment record, and automatically populate several fields from the opportunity, adventure, and adventure package data. Update the Adventure Package Fulfillment Creation field to true. Update the related Opportunity to reflect the waiver and insurance needs on the Adventure. Set the 'Needs Insurance' field on the Opportunity to match the 'Needs Insurance' field on the Adventure record. Set the 'Needs Waiver' field on the Opportunity to match the 'Needs Waiver' field on the Adventure record. Create a task for the sales rep to review the fulfillment, and remind rep to double check the explorer data is properly mapped to the fulfillment record. Assign a task to the opportunity owner. Add this task to the opportunity with Priority = Normal, Status = Not Started, and Subject = any sentence you choose to explain the task. As an extra precaution, you decide to create one more future action to remind reps to check the adventure package and fulfillment records. Schedule a chatter post for the opportunity owner for 14 days from today. Include the Adventure Name, Opportunity Name, and Adventure Package Id in the post. You want to make some additional changes to further automate your sales process. Create another process named Sales Automation. You’ll customize three opportunity stages with automation for each stage. Awaiting Approval If the status changes to awaiting approval and there is a positive discount value, kick off the discount approval process. If no discount is applied, the status updates to Scheduled because no approval is needed when a package is purchased at full price. Deposit Made After a deposit has been made, it’s reflected on all fulfilment records related to the opportunity by setting the fulfillment status to Paid Deposit. Cancelled If an opportunity is cancelled, it’s reflected on all fulfilment records related to the opportunity by setting the fulfillment status to Cancelled. Create a third process named Fulfillment Cancellation Automation to handle cleaning up data if an opportunity is cancelled. If the fulfillment is cancelled before the scheduled adventure date, the explorer loses only their deposit. In this case, find the original adventure package that triggered the creation of the fulfillment record and update the sales price to equal only the deposit amount. In addition to sales, you need to automate service. Remove all existing Case Reason values, except for Feedback and Other. Then add the following new values: Injury, Equipment Related, SOS, Fulfillment Issue, Open Adventure Package Issue, Closed Adventure Package Issue, Scheduling, Cancellation/Refund, and Special Needs. Create a way for expedition leaders to log cases from their phones and name it New Expedition Leader Case. Ensure the ability to create a new case is available from Lightning Experience, and for data integrity reasons, the new case should be created directly from the fulfillment record. This short form creates a case related for the fulfillment and includes the subject, description, reason, status, priority, and related explorer. The explorer and fulfillment information should be auto-populated with the related data from the fulfillment and have a default priority of High. You have adventure package and contact data that you need to import into Salesforce from a legacy system. You’ve already renamed the standard objects to match the legacy system’s schema. Import the data from this spreadsheet. Be sure to preserve the existing relationships in the data, and map as many fields as you can without creating new ones. After reviewing the Salesforce UI, you’ve decided to make a few simple changes. Sometimes reps show adventure records to prospective customers on their phones. Add the custom photo uploader component included in your unmanaged package to the top-level record view so that reps see it when they open an adventure record. Give sales reps a visual indicator to compare product performance. First, create a summary report on opportunities named Opp Stage by Adventure. Filter it by Product Date within the past year. For the purpose of this superbadge, assume this date range is 1/1/2026-12/31/2026. Second, add a stacked vertical bar chart of the number of explorers by product name, grouped by stage, to your summary report. 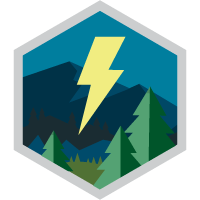 Finally, add this chart to your Lightning Adventure Record Page with the label Adventure Stage Comparison. To ensure that this chart isn’t accidentally displayed to customers, add it to a new section called Adventure Comparison. Fulfillment team members want to see key explorer and adventure data at the top of the fulfillment record for post-sales processing and scheduling needs. Create a view where the following fields are highlighted at the top: related contact, related adventure, the explorer’s preferred contact method, whether the explorer has submitted a waiver, and the fulfillment status. Although this is designed for the fulfillment team, ensure that everyone has access to this information in the view. Lastly, you want to help Relaxation Gauntlet employees find just what they need in the org. Modify the navigation menu so that employees see only the necessary tabs: Home, Explorers, Opportunities, Adventures, Fulfillments, Reports, and Dashboards. Enable this navigation for the sales, service, and fulfillment profiles (expedition leaders and fulfillment team members), system administrators, the custom support profile, and custom sales profile.